A knife-wielding robber raided a bookies after bursting in through the ceiling and tying up a staff member. 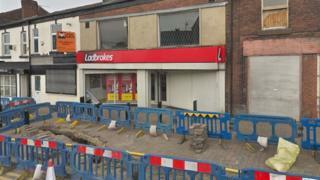 The woman, aged in her 30s, was left shaken after she was confronted while opening up Ladbrokes on Tonge Moor Road, Bolton, at 08:10 GMT. The masked robber, described as about 5ft 4ins (1.6m), fled through the back of the building with stolen cash. Det Sgt Craig Wallace said the force was "focused on identifying this man and bringing him to justice".